According to the manufacturer, scientists developed the concept of using external compression to aid the body’s normal circulatory system in the 1960s. In 1998 Dr. Laura Jacobs combined compression with a massage pattern. The compression initially was applied to patients with circulation-related disorders including lymphodema, a swelling caused by fluid buildup in soft body tissues. In 2007, NormaTec added an Athlete Technologies division. 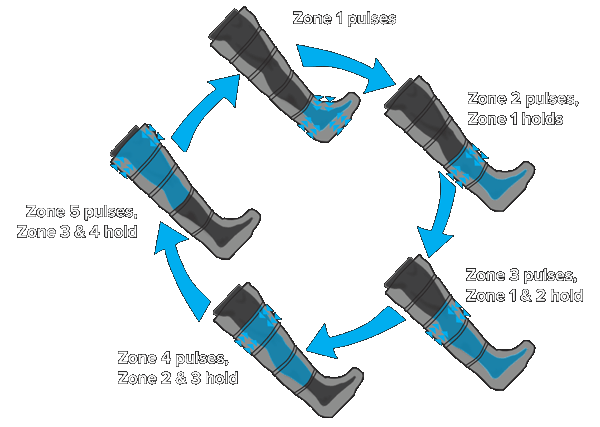 An individual slips each leg into a full-length nylon boot. The boots, connected to a compressor, inflate much like a blood pressure cuff around the arm. Once inflated, the boot begins sequential pulsing, starting at the base of the foot and moving up to the ankle, calf, knee and upper quad.